Court documents show "neck breaking" and "household weapons" were some of the Google searches performed on a computer accessible to the mother of a missing Florida 3-year-old. Casey Anthony has pleaded not guilty to first-degree murder and other charges in the disappearance of her daughter, Caylee. The child disappeared in June, and authorities say her mother didn't report her missing until July. The description of the searches was included in more than 700 pages of court documents released in the case this week. The Orlando Sentinel reports that the searches also included "how to make chloroform" and took place in March. Someone also used the computer in March to search for peroxide, acetone, alcohol and "lost numbers." Court documents also showed that Casey Anthony's grandmother told investigators that Anthony had stolen checks from her on several occasions, starting in 2007, according to the Orlando Sentinel. Shirley Plesea said she wanted to press charges against her granddaughter, but didn't for the sake of Caylee, documents showed. Cindy Anthony, Casey's mother, first called authorities in July to say that she hadn't seen Caylee for a month and that her daughter's car smelled like death. Casey Anthony told authorities that she had left her daughter with a babysitter in June, and that the two were gone when she returned from work. She says she spent the next month trying to find her daughter and didn't call authorities because she was scared. Investigators immediately started poking holes in her story. 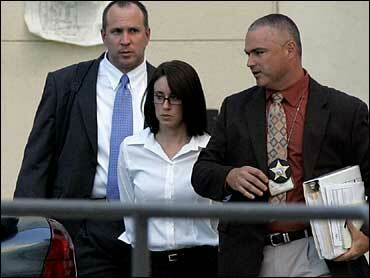 The apartment where Casey Anthony said she had left her daughter had been vacant for months, they said. They said she also lied when she told them she had been working at an area theme park as an event planner. Anthony was indicted on murder charges in October and remains in the Orange County Jail.